The Solomon Islands’ Honiara Hotel is a quirky beacon of hope and bizarre excess – the ultimate character in a country struggling to fulfil its promise as paradise, writes Michael Wayne. The mermaid is revolting. Her fibreglass skin is covered in grime, her stringy hair falls lazily over her face, and her soulless gaze challenges the world to meet it. “She’s a work of art,” her creator tells me. If that’s true, the Honiara Hotel, a sprawling 56-room inn carved out of a mountainside above the Solomon Islands’ seaside capital, is his masterpiece. Despite its 1970s trappings, the margarita bar has an old colonial feel. It’s full of characters. Fat, sweaty old white men down beer after beer, laughing over something lowbrow or unsavoury, while dark-skinned servants attend to their wants. Transient guests appear at random, and while their backgrounds vary, that expression – a potent cocktail of disappointment, bewilderment and grimace – never does. The giant fibreglass flowers that adorn the hotel’s gate belie the art gallery within. They were a cute touch, I thought upon arrival, a relic from another era. It’s moist up here, as if the air itself is sweating. In the city far below, the have-nots do their best to earn a share. Even so, they’ll never be guests here. The Honiara Hotel’s original 13 rooms are housed in its old wing. Despite Honiara’s constant and oppressive heat, they remain without air-conditioning. Retro is in, don’t you know? There’s the new wing, 12 deluxe rooms and five executive suites carved from the hills behind the city. They’re reachable by funicular (if it works) or the many stairs (when it doesn’t). Then there’s my wing, 26 rooms that are just outside the wifi range, and well inside the mosquito range. At least there’s air-con. Unlike the bar. Propped up in the corner with my notepad and Sprites for days, even I seem to fit right into the tropical noir feel. There’s only one thing out of place – in every one of the Honiara Hotel’s vignettes is a grotesque fibreglass statue. The entrance features a rainbow lorikeet drinking a beer, a pair of loved-up horses, and a water feature that includes the mermaid, surrounded by leering dolphins. Each one is a character. Another mermaid languishes by the swimming pool, right by a diminutive, besuited old Asian man. I’d seen him around the hotel a lot, with a twinkle in his eye and a beer in his hand. I ask the bartender, Dinah, who he is. “That’s Sir Tommy,” she says in a hushed tone. It’s not hushed enough – he’s heard us. He smiles and asks me what I’m having. Sir Thomas Chan is the owner of the Honiara Hotel, and the definition of a character. At the front desk, photos of Sir Tommy’s knighthood ceremony – in which he has the same twinkle in his eye as the Queen taps his shoulder with her sword – sit perfectly incongruously beside 1970s shots of Sir Tommy in his champion waterskiing days. Born in the Malaita province of the Solomons, Sir Tommy has been involved in the nation’s business and political arenas for decades. He received his knighthood in 2006, for services to charity. His father opened the Honiara Hotel in 1968 as a way to make money for his family. 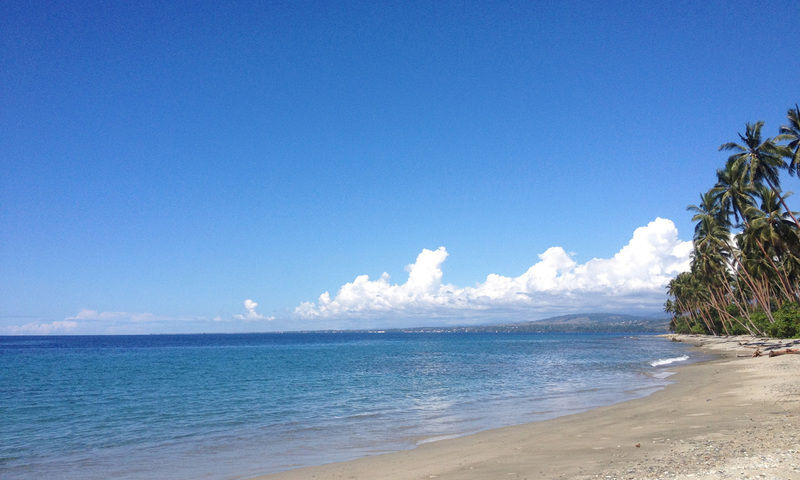 Back then, Honiara was a tropical holiday destination in progress. In the years since, it’s been torn between fulfilling its duty as a home to more than 84,000 Solomon Islanders, and living up to its promise as paradise. Sir Tommy laments his country’s struggle to fulfil that promise. “This is a beautiful country, but we need to show the world that we have so much here, so much we can offer,” he says. It must be a tough thing to admit even your own efforts aren’t enough. Honiara still isn’t known for its accommodation. There are a few dated motels, and a couple of newly built, top-shelf resorts have sprung up along the beaches, but that’s where it ends. The Honiara Hotel is a quirky beacon of hope and bizarre excess. It’s the ultimate character: the city’s own Mount Olympus, populated by cashed-up gods who live in ways beyond imagination to the plebs below, with Sir Tommy is its Zeus. I can’t help but ask: what’s with the statues? Art in the South Pacific is usually derived from indigenous culture, but the Solomons are unique. A tour of Honiara’s art gallery reveals the kind of imagery lodged in the collective consciousness: vivid depictions of war exploits and the ideological struggles that formed the civil unrest that threatened to destroy the Solomons in the late 1990s. The fibreglass phase was just a spasm in Sir Tommy’s long and colourful career, but the fruits of its floundering are on show throughout the hotel grounds. Yes, he makes them himself. He’s quick to take me through the entire process of how he creates his works, from the grid-paper of the planning stage to the fibreglass moulds of the finished product. He’s particularly proud of his mermaids. “Mermaids are beautiful, so I based these on two beautiful Hollywood actresses,” he says. She sure did. The mermaid guarding the hotel’s side entrance has dark hair and big lips, but that’s where the comparison ends. Sir Tommy fills the pregnant pause with a strange hand motion I can’t decipher. They say a magician should never reveal their secrets – this is one of those times. Dated as the Honiara Hotel may be, it’s not going anywhere anytime soon. My last night in the Solomons is spent not at the Honiara Hotel, but at one of the sparkling new resorts on the beach. It’s great – the room is modern, the restaurants are all open, and there’s a network of gas tanks that repel the mosquitoes. There’s just one thing missing. Character. Getting there: The Solomon Islands are around three hours’ flight time from Brisbane. Unfortunately, Brisbane’s the only capital from which Solomon Airlines departs, so you’ll have to factor in travel time from Adelaide. The writer travelled as a guest of Solomon Islands Visitors Bureau.